There are four ways to cut a cigar without a cutter; 1.) Use your thumbnail to make a circular cut, 2.) make a punch cut with a pen, pencil, or stick, 3.) use a sharp pocket knife or key, or 4.) bite off the end with your sharpest teeth. Keep reading for tips on using each of those options. Sometimes you just don’t have the right tools at hand. You’re going to have to think like MacGyver and improvise with whatever you have around to cut your cigar. 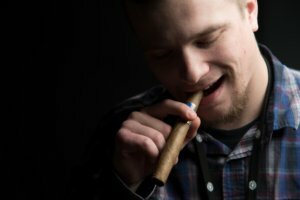 This guide is for anyone who’s ever been caught without a cigar cutter, staring at their cigar with forlorn eyes, unable to remove the cap and puff on that delicious tobacco. Don’t try this except in an emergency. Even if you do it right you’re going to get tobacco salad in your mouth, and your cigar wrapper will almost inevitably start to unravel at some point. 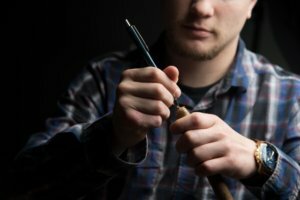 There are a couple ways to bite-cut a cigar – the easiest being the most obvious. Just chomp down right at the spot you would place your normal cigar cutter. Bite hard and fast, pulling away at the end. 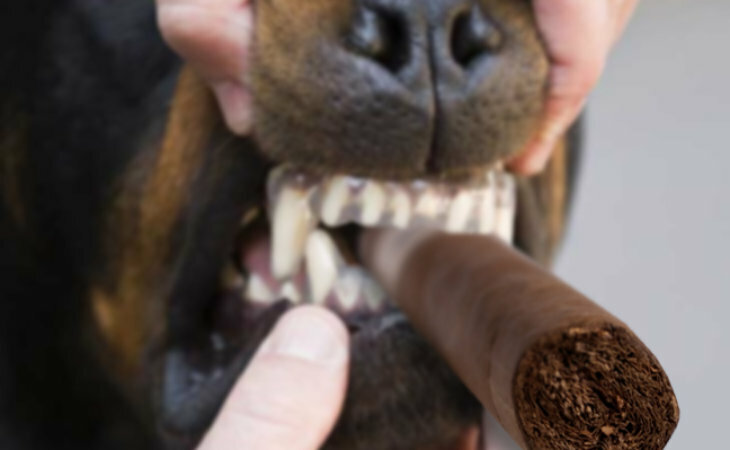 More skilled cigar biters actually place the head of their cigar between two incisors, cutting off a circular portion of the wrapper by rotating the cigar between their sharpest teeth. This is much cleaner but more difficult. The best part of the ‘bite it’ method is that you always have your teeth handy, no matter where you are. We recommend you buy a cheap bundle and give it some practice. 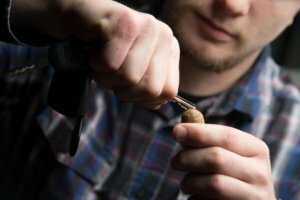 It’s possible to use your pocket knife, or in a pinch, your car or house keys to cut a cigar. It seems simple enough if you’ve got a nice, sharp knife to give your stogie with a nice swift chop. As someone who has tried this, let me just say it’s not as easy as it sounds. Like biting the cigar, you’re likely to come away with a mangled wrapper at the head. Real cigar cutters have a mechanism to steady and guide the blade – without this, it’s hard to make a clean chop. 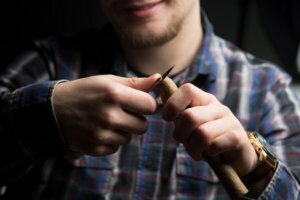 Another option is to take your knife (or the sharpest key you can find) and mimic the incisor-rotating method described in the ‘Bite It’ tip. Trace a circle where your cut line would regularly be, and gently tear away the wrapper. Once you start thinking out of the guillotine box, you realize there are way more ad hoc options to stab a hole in your cigar than to slice the cap. I wouldn’t call it a ‘punch cut’ because that infers a clean punch. This is going to be more like a stab or a poke. A pen, pencil or stick jammed into the head in lieu of a punch cutter is probably the best improvised cigar cutting methods out there. On bigger-ring cigars you’ll have more surface area to poke, just make sure you poke a hole that’s large enough to accommodate the thickness of the cigar. Also, make sure that you don’t go too deep with the stabbing motion. You’re trying to cut the cigar, not kill it. You’re probably grumbling right now that you don’t have long nails. Neither do I and I use this one all the time. In fact, it’s my favorite out of the four because it’s the cleanest, most reliable, and you always have it with you. Instead of using the tip of your nail, the secret is to use the corner of your thumbnail. No matter how meticulous you are about personal hygiene, there will also be a slight corner in this area, just sharp enough to pierce a cigar. You’ll want to cut a hole similar to the size of a punch-cut or slightly larger. 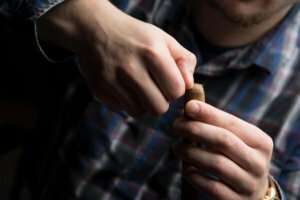 Press the corner of your thumbnail into the cap and slowly start to rotate the cigar. Once you get a groove established, just keep going in circles. Make sure you get through the wrapper and the binder, since the binder is a tougher leaf and will not relent easily. You’ll end up with something like a cross between a punch cut and a guillotine cut. Test your draw and adjust accordingly by prying away from the center of the cap. Don’t waste time wondering how you’re going to cut your cigar next time you’re out in the wild with no cigar cutter, just refer to these handy tips.